Searching For A Smarter Finance Solution? Demolition gives a mentally strong image. The act of destroying something is so powerful and it is certainly not for the faint hearted. But there is another side to it, hidden away – it is all the planning and organising behind the scene. It is the stage that pushes for progress; the development begins at the early stages. While demolition is the end of an era, its planning is certainly the new beginning. A big part of the operational aspect is the disposal processing of the demolition waste. Operations in suburbs and in large metropolitan cities can have logistics, dust and noise restrictions that require to be resolved rapidly and economically. Not forgetting, of course, the cost of transporting materials to the dump, an expenditure item which can sometimes be unsustainable for companies. For the last 17 years MB Crusher’s product range has been operating all over the world, resolving the problems companies have to deal with in the workplace. Worksites with the need to reduce noise and dust and manoeuvre easily in narrow spaces: in Germany, for example, the use of the MB crusher bucket has enabled many enterprises to eliminate the costs for transporting materials to the dump and salvage all the aggregates existing on the worksite. While considerably reducing emissions and consumption levels and damping acoustic pollution. In particular, in the region of Hessen, an MB customer had to demolish a house in the centre of a residential area. With just one machine (excavator and crusher bucket BF80.3), the work was rapidly completed and all the waste materials were salvaged and used to refurbish the courtyard. In Bavaria, on the other hand, the crusher bucket model BF90.3 was used in a city to restore one of its most important squares in front of a church. The crusher bucket crushed the cobblestones and limestone blocks produced by previous excavations. The aggregates were immediately reused on the same worksite for filling in the foundations of the new square. When buildings are close together, vibration represents a limitation. MB crusher has got a unit that will solve this problem. MB drum cutters have the patented direct drive twin motor system that distributes the force of the two rock cutter heads in different ways. Since the power of the two drums is managed based on toughness of the material, the vibrations transmitted to the excavator arm are absorbed. 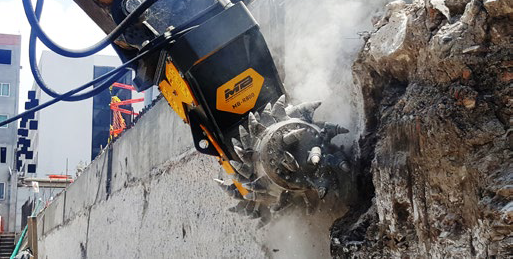 In Mexico, as MB-R800 drum cutter mounted on a 20 tonne Cat excavator managed to eliminate all the excess material on a wall of a shopping mall. One other, of many, problems is safety, both in terms of personnel and the moving of vehicles, machinery and material. 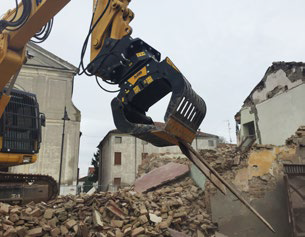 A practical example of efficiency in regards to safety is provided by a worksite in a small Italian city where a demolition company used the MB Crusher MB-G900 grapples model in order to demolish a three-floor building in a residential area. This was a winning choice thanks to the unique features of the product: it is safe (it is equipped with a fall-stop safety valve), it makes very little noise (thanks to the silent block), it is easy to maintain and versatile (its claws are interchangeable). A totally different matter is reclaiming reinforced concrete. The bars in the concrete make it difficult to process so the reclamation stage is long and costly. But not with the MB units, in France, for example a combination of a crusher bucket BF80.3 with an iron separator and a New Holland excavator are paring up to recycle the railway sleepers that were cumulated. In Brazil, the accumulated items were long lightposts discarded as waste due to the difficulty of the reclaiming process. However, with the use of a Bucket Crusher BF60.1 mounted on a Case CX130B, these old posts became font of income: easily processed to extract the iron, which is then resold. The alternative in the market given by MB jaw crusher bucket is a cost-effective way where concrete can be separated from the iron. To facilitate this operation the suggestion is to load the bucket with an MB grapple and let the jaw and gravity do the rest. Alternatively, skilled operators can feed the bucket manoeuvring the excavator; a magnetic kit installed can also facilitate the separation and salvaging the metal. All MB Crusher units can work with any brand of excavator, utilising their hydraulic system so materials that represented difficult waste to dispose can be not only a revenue font, but an easy task to accomplish. Therefore, companies using MB Crusher Buckets can have the opportunity to be ahead of schedule and within budget, even in jobs considered challenging or drudgery. Copyright‌ ©‌ 2018 -‌ Mayne Media Group - All‌ rights‌ reserved.